Theft from site costs the construction industry £1m a day. 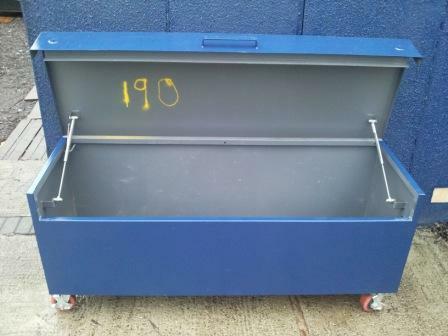 These high security tool vaults allow you to lock away tools and fixings while off site. They come wheeled to comply with manual handling regulations (1992). It also speeds the completion of your contracts as you can have everything you need right where you are working. Why Hire A Tool Vault? It is worth investing in security for your kit and hiring a tool vault is a brilliant option which will keep the tools of your trade safe and secure. There is nothing more sickening than having your valuable tools stolen while you are working on a construction site. Sadly, it is an all too common problem especially during the winter months, with more than a million pounds-worth of tools being stolen from sites up and down the country every day. Although it is wise to make sure your equipment is secure all year round, it is particularly prevalent in winter when daylight is limited. At that time of year there is also a lot of sickness around and in turn, an influx of temporary workers on site. Tool vault hire means that you can go about your daily tasks without having to worry about losing expensive, precious and hard-to-replace equipment. You can protect your tools with Lakeside Hire and rent a high security tool vault which will allow you to safely lock away all your implements while you are off site. The vaults comply with manual handling regulations (1992) and have individual security numbers for easy identification. The vaults can also speed up the completion of your contract because you will have access to everything you need safe and in order, right where you are working. Taking all your equipment home at the end of the day when you know you have weeks left on site seems to be a pointless task but with a tool vault you can simply lock it all away safe in the knowledge that it will all still be there when you come back in the morning. It also means that you can save time and effort in the morning so you arrive for work fit and ready to go. Save yourself time and money and put your mind at rest by hiring a tool vault from Lakeside Hire today.